As one of the largest cities in the world, and certainly one of the most multi-cultural, London is home to tens, if not hundreds, of thousands of different offices. Office design in London is extremely important for all these businesses, and could be the difference between a business' success and failure. As space is extremely limited in London's heart, more and more property owners are choosing to build high-rise properties which can offer residential areas as well as commercial offices. London is becoming an ever more vertical city, and hosts some of the tallest buildings in Europe. As the capital continues to become more vertical, and more buildings are being designed with the express purpose of contemporary offices, it's no surprise to see that more and more workplaces are focused on providing spaces for the employees of the future. You only need to look at the development of properties like the Shard and the Gherkin to see that employees are sick and tired of traditional working environments, especially in high-earning businesses. 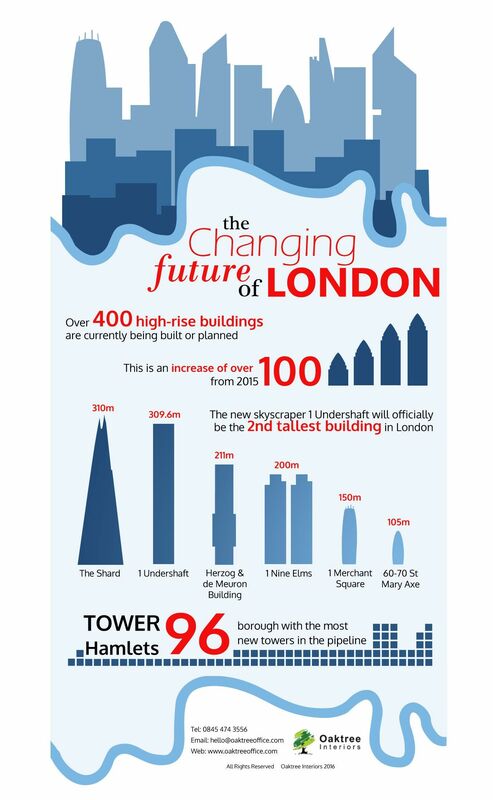 There are more than 400 high-rise buildings (buildings with more than 20 floors) either constructed, approved or under construction across London already, and over the next five years we expect that number to increase. One of the most widely known of these new constructions is 1 Undershaft, which will replace St Helen's tower and, once it has been completed, will become the second tallest building in the UK – being beaten only by the Shard which is a mere 12 metres higher. 22 Bishopgate (formerly the Pinnacle) – 62 floors. 6-8 Bishopgate – 40 floors. 100 Bishopgate – 40 floors. 60-70 St Mary Axe (Can of Ham) – 24 floors. Pan Pacific Hotel at Heron Plaza – 44 floors. One of the major concepts for future office design in London which is really going to make a difference to the way we approach work is the development of shared office spaces. These are going to be areas which allow smaller companies to band together with similar organisations to share a high-end office space. This is going to be particularly essential in creative industries, such as advertising and marketing, and will allow even small businesses to take advantage of a thoroughly modern office space in one of these fairly expensive high-rise buildings. Developing a shared office is going to take a lot of trust amongst the businesses involved. However, by having a large percentage of the office be a shared area, with private rooms that are no-entry for other companies, this idea could really be a great option for many smaller businesses to take advantage of these impressive, high-rise buildings. One thing is certain; the world of office design in London needs to change if it hopes to keep up with the changing landscape of the capital as well as the new buildings that are being built around the city. Here at Oaktree, we are able to provide complete office design in London to ensure that you can make the most of your working space. We can help you to create a unique working environment in any kind of property, from the historic townhouses of Westminster to the glittering skyscrapers of the City of London. For more information, or to start to improve your office design in London today, get in touch with our team on 0845 474 3556.